Optimizing your existing wireless network or building a new one requires understanding the behaviour of radio waves and identifying signal interference and connectivity issues. For a limited time, Core Cabling is offering 1 Free Predictive RF Survey per month. If you would like help understanding your wireless needs and designing a wireless network to suit these needs, get in touch with us today at 905-235-7755 or simply Request a Quote online. A wireless site survey, or radio frequency (RF) survey, is the first step toward determining and documenting precisely what your company’s unique requirements are for improving an existing wireless network or establishing a new one. RF surveys identify the number of access points your business needs and where they should be placed to ensure you get adequate wireless coverage throughout your building or across your campus. They also help detect how much wireless interference your network must filter through to avoid it from degrading your firm’s WLAN. Our team uses industry-standard survey tools to map RF coverage and capacity to provide you with an accurate, documented view of your network and related challenges. THE HEALTH AUDIT Wi-Fi RF SURVEY Our health audit Wi-Fi surveys are an invaluable means of diagnosing poor performing wireless networks, whether that means outages, poor data throughput, interference or connectivity issues. 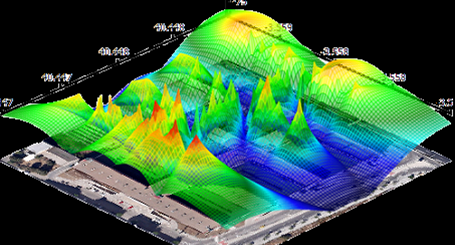 NEW NETWORK RF SURVEY The RF survey is arguably the most integral step to designing your wireless network. Traditional wireless networks were designed to provide coverage only, whereas today's networks require planning for both coverage and capacity. CORE uses industry standard survey tools to map RF coverage and capacity to provide you real-world documentation of your expected results. POST-INSTALLATION Wi-Fi RF SURVEY A post-installation Wi-Fi survey confirms whether or not you have the coverage, capacity, and the flawless data throughput your company demands. Get the documented proof you need to know you’re getting what you paid for on all new and existing wireless networks. OUTDOOR RF SURVEY In most cases, establishing and maintaining an outdoor wireless network is far more complex than an indoor wireless network. CORE’s outdoor RF survey can help by analyzing your environment, and to design a stable, reliable outdoor network that will meet or exceed your expectations.